We’re in the middle of March Madness fever, and this year, I’m particularly excited because my team, the Tennessee Volunteers, has made it to the Sweet 16 round!. They play tonight, and because the Vols are known as the Big Orange, I need an appropriately orange-colored cocktail to celebrate. A quick look at my bar and the bottle of bright orange Aperol popped out at me. 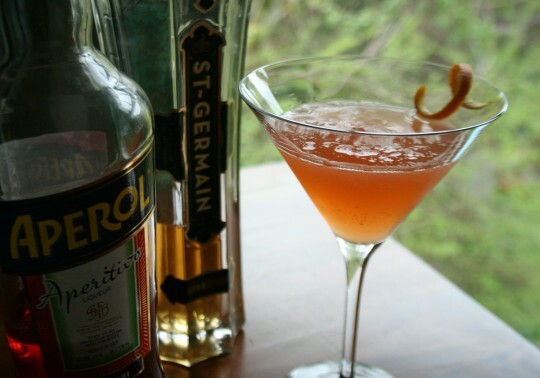 I wanted to find an Aperol cocktail that wasn’t an Aperol Spritz, so looking online, I found one that was originally from the Mr. Boston Official Bartender’s Guide. It combined Aperel, St. Germain elderflower liqueur, vodka and fresh lemon juice to make a bright, refreshing mix – The Mr. 404 Cocktail.